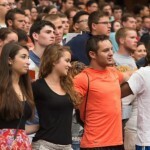 Syracuse University students give in a number of ways, and encourage others to do the same. As part of Philanthropy Week, we asked them why they give and what they give, and how the smallest gesture can be important. Why I Give? from Syracuse University News on Vimeo.